Thomas Wood, the famous 18th Century Billericay miller was born on the 30th November 1719 to Abraham and Mary Wood in Mill Cottages. By the age of 13 he had survived the many illnesses that killed a great number of children at that time, including smallpox. In full health he began a life of self-indulgence, eating and drinking ale to excess. Consequently by the age of 44 his weight had reached enormous proportions, and he began to suffer from ill health including gout, epileptic fits, sickness, bowel pain, headaches, vertigo, sleeplessness, rheumatism, bad moods, low spirits and feelings of suffocation after meals. The community began to refer to him as Billericay’s ‘Ghastly Miller’. In desperation he sought advice from the Reverend Powley, a neighbourhood clergyman who suggested he should change his eating habits and recommended a book by Luigi Cornaro, a 17th Century Italian dietician. The recommended diet was to eat a pudding made from seabiscuits mixed with boiled skimmed milk and eggs. He was to abstain from alcohol, drink only water and avoid all forms of animal fat, full fat milk and butter, surviving solely on the pudding. He took cold baths two to three times a day, exercised with dumbbells and strictly controlled his sleep. This strict regime and vegetarian, dairy free diet worked very well for Thomas and over a period of two to three years his weight decreased dramatically and his health was completely restored. Due to superstition Thomas never allowed himself to be weighed, either before his diet or afterwards, however it is estimated that he lost between ten and eleven stone in weight. This restrictive lifestyle soon earnt Thomas the name ‘the Abstemious Miller’. His recovery was so successful that it was reported in the ‘Gentleman’s Magazine’ in London. He began to receive letters from the public asking for his advice and a cure for obesity. Some requested his portrait which he duly commissioned and is shown below. From the letters Thomas wrote it soon became evident he was not the greedy, ‘Ghastly Miller’ which he had been labelled. He was in fact a caring man, who looked after his horses well, ensuring they were well treated and not overworked. He was an acknowledged expert cultivator of auriculas, and often held open days at the mill to display his plants. Thomas held the public office post of ‘Overseer of the Poor’, which entailed administering relief for the poor in the form of money, food, and clothing, perhaps indicating a compassionate nature. He was a religious man and worshipped at St Mary Magdalene Church in Great Burstead. Thomas was married to Elizabeth Finch (1724-1801) and had four children: Thomas (1754), Elizabeth (1755), Abraham (1757) and Isaac (1758) and eight grandchildren. Thomas died of bowel inflammation in 1783 aged 63, he is buried in St Mary Magdalene Church in Great Burstead with his grandson John Finch Wood who died in 1797 aged 4 years. His wife lies at his side. His gravestone can be found in the churchyard today. In the portrait which can be found in the Cater Museum, Billericay, a 53 year old Thomas Wood can be seen standing in his back garden, two mills are depicted, the original mill which dates back to the 16th Century and the second mill seen in the left background, which was built by Thomas further along Southend Road between the original mill and School Road. A posy of auriculas can be seen in his button hole, highlighting his expertise in the cultivation of this flower. A coldframe is depicted in the foreground indicating his interest in flowers generally. Thomas Wood’s portrait and two tankards belonging the Thomas Wood can be seen in the Cater Museum, Billericay High Street. Copies of the letters written by Thomas can be seen on request. Thomas thought it best not to make a total change in his diet all at once. At first he cut down his consumption of ale to one pint a day and ate animal food sparingly. After two months he began to feel lighter and his moods improved. Encouraged, he cut back further on ale, and ate less still of animal food. He continued in this way until 4th January 1765. After this date he took the diet a stage further, completely abstaining from ale, drinking only water and eating no red meat. This relieved most of his symptoms however he still suffered from rheumatism and gout. On 4th June 1765 he began dumb bell exercises and started taking cold baths two to three times a week. He continued the cold bath practice until 29th October 1767. On the 25th October 1765 he took his last drink of water, he abstained from water until 9th May 1766 when he drank two and a half glasses of water. Since that date until his death he drank no more of any liquor except that taken in the form of medicine. From 30th June 1767 he avoided cheese, having given up butter some time before. From 31st July 1767 he abstained from all meat, from which date his diet consisted primarily of pudding made of sea biscuit. The pudding was made with three pints of boiling skimmed milk poured onto one pound of the best sea-biscuit, broken into pieces. It was left overnight and in the morning two eggs were added. It was then boiled in a cloth for one hour, until of the consistency that it could be cut with a knife. One and a half pounds of this pudding was eaten at 4am, 12 noon and for dinner. Eventually Thomas also removed the egg from the recipe. Thomas allowed himself very little sleep, going to bed at 8am or earlier and rising between 1am and 2am. Thomas followed this strict regime for the rest of his life as it restored him to complete full health. a clear and strong voice: his voice was entirely lost for several years previously. 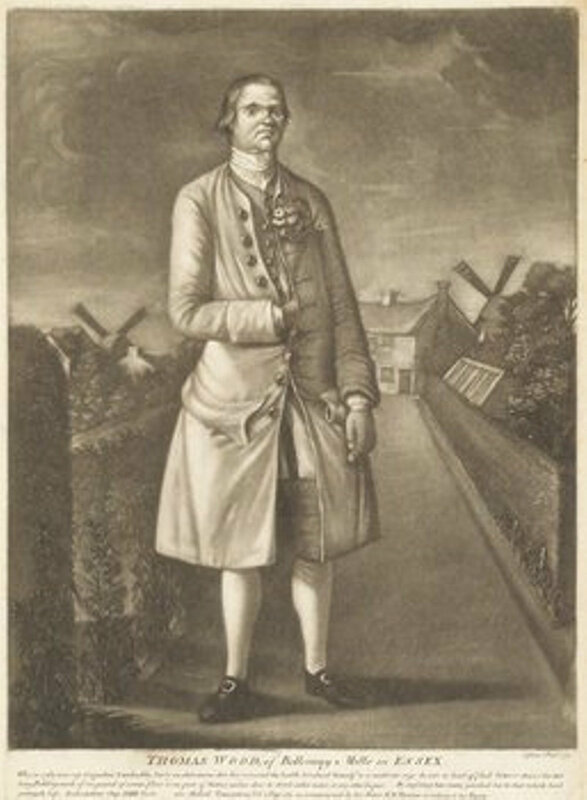 (1) An Old Essex Correspondence, Letters to and from Thomas Wood, Miller, of Billericay (1719–1783), Reprinted from the Southend Standard, page 8. On 21 November 1850 William Wood ‘of the mills’ was sentenced by the magistrates at Billericay to 3 months imprisonment for poaching at Norsey Woods. He was escorted on a 7 mile walk from Billericay to Brentwood for onward transport to the County Gaol at Chelmsford by PC Robert Bambrough. Wood decided to try to escape and there was a scuffle resulting in the policeman being badly injured. The policeman was rescued and and taken to the Chequers Inn, Billericay High Street, where he later died. In March 1851, aged 20 William Wood was convicted of the manslaughter of PC Bambrough and sentenced to transportation to Australia for life. A memorial stone was erected in PC Bambrough's honour by members of Billericay Police on 21st November 1990. Its is located in Havering Grove, west of Billericay along the A129 on the verge near Church Green.